I spotted this new item in the bakery case of Peacefood Cafe on the Upper West Side. Peacefood has proven themselves over and over when it comes to superb vegan baked goods. More times than not they are as good, or better than their animal-product counterparts. These donuts were no exception. 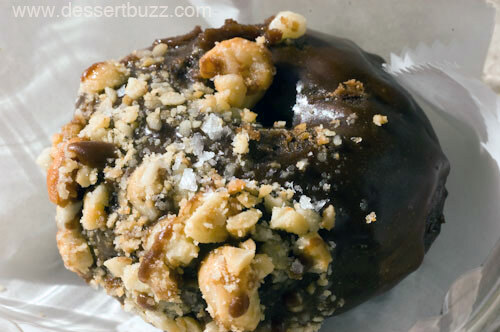 They had a thin dark chocolate coating which was then coated with macadamia nuts and sprinkled with sea salt. They were moist and cake-like and very tasty. Make no mistake, these were vegan but there was plenty of fat in these doughnuts–but that’s really what you want in a doughnut. $2.00 each. My other favorite vegan donuts are from Vegan Divas. I have to say that almost anything would taste amazing dipped in dark chocolate and then rolled in macadamia nuts and sea salt. Thanks for sharing these vegan treats. Vegan is still misunderstood and underestimated. It’s only by showcasing such tasty goodies that one can change people’s mind about vegan food. You’ve just showed that vegan can taste good. The chocolate-macadamia blend is wonderful. @ Savorique it’s totally misunderstood – betweenVegan Divas and this place you could eat vegan desserts for the rest of yoru life and not miss the milk, eggs or butter. That’s so funny, I was at Peacefood yesterday too! 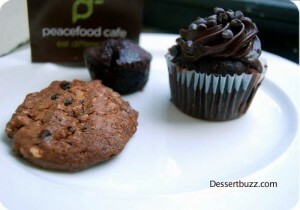 Their vegan baked goods are so amazing, as is their carrot cake, you must try it next time! I don’t understand why it would be a surprise. 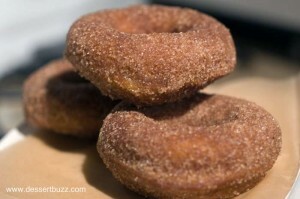 Unless they’re fried in lard (or have a little milk in the dough) donuts are already vegan. I’ve never seen a recipe for them that used eggs. The City Sweet Tooth » Sweet Links of the Week – 5/13!